Poor air quality can harm your health. Take action to reduce your exposure to air pollutants. 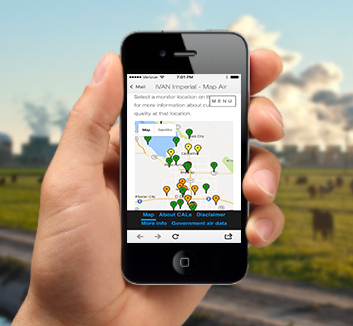 Use the list or map to view current air quality levels at your nearest air monitor. Sign up to receive alerts when the air quality near you is unhealthy. Scroll down to learn more. IVAN Air Monitoring is a network of 40 air monitors located throughout Imperial County. These monitors measure current levels of particulate matter air pollution (PM2.5 and PM10). The air quality measurements are displayed on this website. 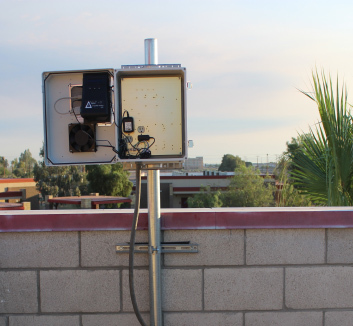 This network was developed in response to the community residents’ concerns about air quality and their desire for more neighborhood-level data. The network was designed with significant input and decision-making from community residents, while incorporating technical priorities to ensure scientific integrity. The network was developed through a partnership between Comite Civico del Valle (CCV), the California Environmental Health Tracking Program, and University of Washington School of Public Health, with funding provided by the National Institute of Environmental Health Sciences, grant number 5R01ES022722-03. Visit the project website.